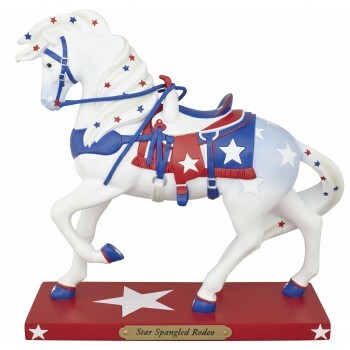 Star Spangled Rodeo | Painted Ponies Everyday Figurines | One Price Low Flat Shipping! From the Trail of Painted Ponies (34th Release) Winter 2015 Collection, Pony Lover Walking Horse. Designed by artist, Kim Ratigan. Made of stone resin. Measures 7" tall. This brightly painted patriotic pony is bright white and adorned with small, shiny red and blue stars on its tail and mane. The base is painted red and features a large five pointed white star.